I will no lose it. chuckle, smile, hugs to you. you certainly no lose it ever. Isn't it just the most perfect fortune cookie message? And the funniest? I think I may put it in my sidebar. 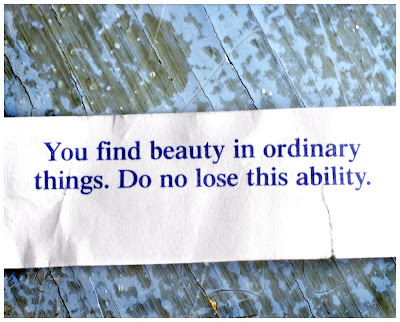 If ever I believed in the truth/sage wisdom of fortune cookies, it is with that one. So perfect for you! I used to live beside an Asian market, so we shopped there a lot. I used to LOVE trying to read the cooking directions written in english on the packages of dried noodles and such. Sooo cute and sometimes extremely funny. I wish I had kept the packages now. aw! I should have made art backgrounds with them. shucks!